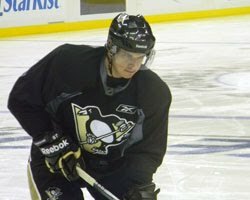 October 10 The Pens were back at work today in practice looking to improve on some of the glaring errors that cost them their first 2 games. When interviewing with the media at today's practice, he said that his team needs to work on some fine details and need to control their emotions when playing the Devils' trap defense tomorrow afternoon. 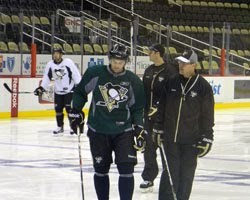 Of course the big news of the day was the revised line combos, as reported by the Penguins official site. Ok so obviously a few things jump out here. Though I agree that Letestu is currently playing worthy of a top 6 spot, Malkin and Comrie had some good chemistry together. Also, one of Comrie's main strengths is his ability up the middle and that is lost on Sid's wing. Dupuis is one in the doghouse here, falling from the top line to the 4th. His play has been lackluster, but isn't 2 games a bit early for such a harsh demotion? 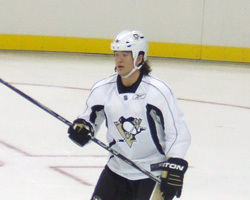 The moods of Pens fans went from bad to worse on Saturday when they heard the latest update about Arron Asham. He went from a questionable day-to-day shoulder injury to indefinitely on the IR. The possibility of surgery has also been tossed around several times from what I'm reading. It may be a long time before he makes his debut with the Pens.